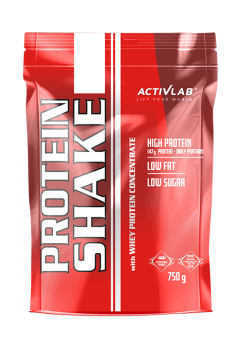 ACTIVLAB Protein Shake is a protein supplement prepared on the basis of whey protein concentrate and soy protein isolate. The product is distinguished by a high protein content with a perfect amino acid profile, with low content of fats and carbohydrates. The supplement was designed for physically active and professional athletes. The sheikh prepared on its basis allows you to easily supplement the diet with the necessary dose of protein, promotes the growth of muscle mass and accelerates post-workout regeneration. Whey protein concentrate is a product made of whey from which water and casein have been removed. It’s believed that this is the most common form of protein. It’s characterized by an excellent aminogram, it’s rich in both BCAA and glutamine amino acids. It absorbs slightly more slowly than the isolate, therefore it’s ideal for night use and in situations where the intervals between meals are several hours. Soy protein isolate is made from soy flour, from which non-proteinaceous ingredients have previously been removed. It’s a source of a nutritious protein with a complete amino acid profile and an extremely high arginine content. It’s absorbed instantly, which is why it works perfectly after physical exercise. Professional athletes and people working on defining their body not only watch the caloric balance, but attach great importance to the contribution of individual macronutrients in the diet. The presented product is the ideal solution for them. It allows you to easily increase the proportion of protein in the diet, and at the same time provides a small amount of carbohydrates and fats. Thanks to this, it’s very easy to balance your individual menu and stick to the diet plan. The presented supplement is distinguished by an unusually broad amino acid profile. Amino acids are the individual components of each protein that allow the growth of muscle tissue, regeneration of damaged tissues and the proper course of various biological processes. A large group of them are exogenous amino acids, which the body cannot synthesise on its own, which is why you must provide them with food. From the point of view of the effective development of muscle mass and the smooth course of post-workout regeneration processes, branched-chain amino acids (BCAA), i.e. leucine, isoleucine and valine, are crucial. The whey protein concentrate is their best source, although they are also lacking in soy protein. This is what distinguishes soy protein against other types of proteins for increased arginine content. This amino acid fulfils a key role in the synthesis of nitric oxide and is often used by athletes to improve the efficiency of the body and increase their own exercise capacity. The combination of isolate and concentrate gives the nutrient a universal character. These two forms of protein differ in the kinetics of absorption. The isolate, as the fastest digested form, is usually used immediately after training. In turn, the concentrate absorbs a bit slower, so it’s worth using it when the interval between consecutive meals is long enough to cause catabolism of the muscle tissue. The presented supplement has both an isolate and a concentrate. It’s an ideal choice for a post-workout meal, but it will also work well at any other time of the day. Taken with the evening meal effectively protects muscles against nocturnal catabolism. The manufacturer of the presented nutrient made every effort to ensure that the final product meets the expectations of the recipients. Available flavours are carefully refined, so even the greatest gourmets do not have to worry that the presence of vegetable protein will spoil the taste sensation. The powder is easily combined with water and other liquids, such as milk and juice. After preparation, the supplement has a smooth, velvety and lumpy texture. The combination of animal and vegetable protein in one preparation has one more important advantage - it has a positive effect on overall health. This is due in large part to soy, which has clinically proven anticancer properties, and also promotes lowering cholesterol and strengthens the skeleton. The whey protein concentrate also contributes to strengthening the health condition. It contains numerous biologically active compounds, such as lactoglobulins or lactoperoxidase. They fulfil an important role in the immune system and promote the strengthening of the antioxidant barrier of the body. In conclusion, ACTIVLAB Protein Shake is a great way to expand your menu with protein. Ideally suited to supplementation around training time. The supplement is most often used by athletes, but it can also be used by people who are not physically active, who prefer high-protein diets. Take 2 servings per a day. Mix a serving (1,5 measure = 30g) with 250 ml water or milk and drink. Take one serving before and another immediately after a workout. Take 2 servings per a day. Mix a serving (1,5 measure = 30g)) with 250 ml water or milk and drink. Take one serving in the morning and the second in the evening. Preparation with high protein content with low carbohydrate and fat content. According to the manufacturer's recommendation, it’s best to take 2 portions of nutrient daily. On training days, it’s best to take one serving before training and the other immediately after. On days off from training you can take one or two servings at any time of the day. Powder dissolves well in any type of liquid, it can be combined with water, but also with skim milk or juice. The supplement was designed for athletes, but it also works well for convalescents and people on high-protein diets. Whey protein concentrate, soy protein isolate, aromas, acidity regulator - citric acid, thickener E466, sweeteners: E950 and E951, coloring: E124 (strawberry flavor), E150c (chocolate flavor), E171 (vanilla flavor). A multi-component pro-health supplement. Protects the heart and liver, lowers blood pressure. A multi-component testosterone booster. It accelerates anabolism, slows down reduce catabolism, and promotes recovery. A dietary non-calorie sauce as a healthy addition to dishes. An alternative to unhealthy sweets.